PC 1 is the Greendale Police car driven by PC Selby. PC Selby keeps order in Greendale and is a good friend of Postman Pat. PC 1 is loosely styled on the Triumph Dolomite as used by several police forces for traffic duty in the UK in the 1970’s. 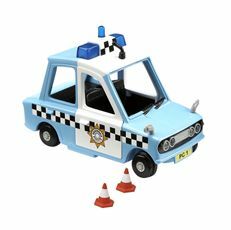 Like previous versions of this Postman Pat toy, the Character Options PC Selby’s Police Car includes two traffic cones and a PC Selby figure. This version additionally features pushbutton sound effects from the updated SDS shows.